James Broderick Design Blog: Off The Map IV - Rising to the challenge! Off The Map IV - Rising to the challenge! 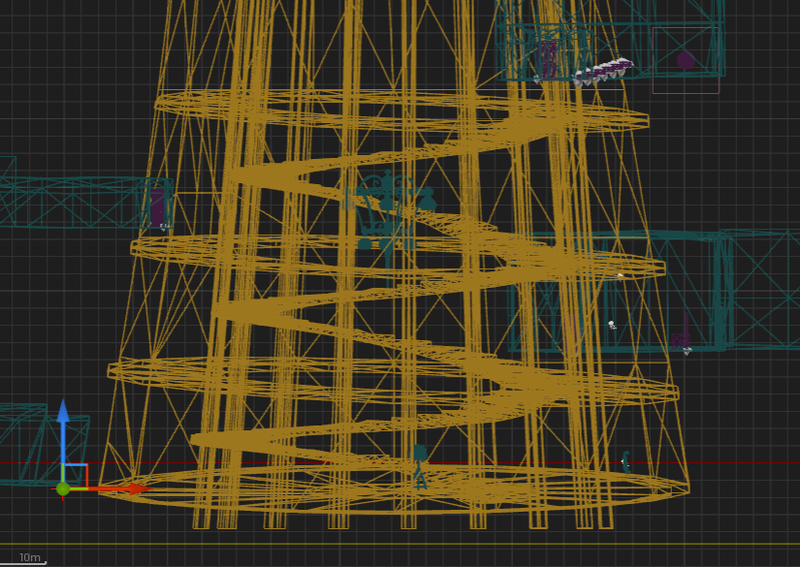 Current stage of the blockout with all the puzzle areas and the rabbit hole. 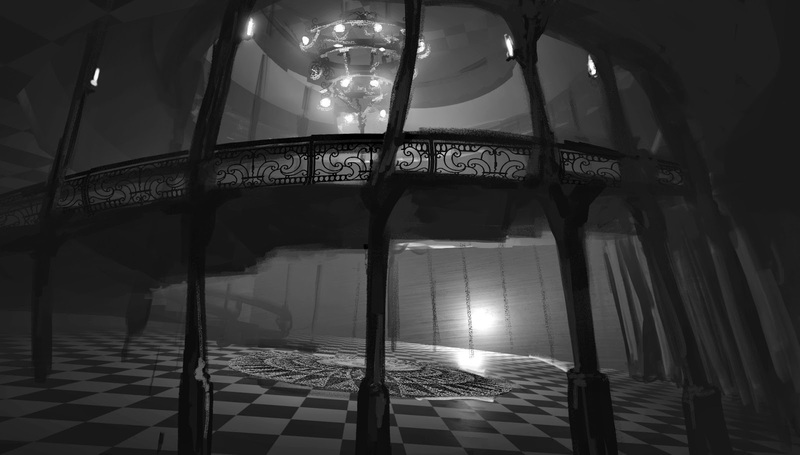 The lobby with the spiral staircase is the area in which the player accesses all the puzzles. The blockout mesh was there but needed tweaking and some paintovers done to make sure everything is how we want it. It was quite a lot of trouble creating the environments all twisty - like a crooked house - but keeping that architectural accuracy so we had to turn down the twistiness quite a bit to make sure everything fitted together smoothly. This was especially problematic when it came to the corridors fitting to the lobby as it angles inwards as it gets towards the top so trying to get a door frame fitting on it plus to an adjacent room and you end up with a whole world of problems. 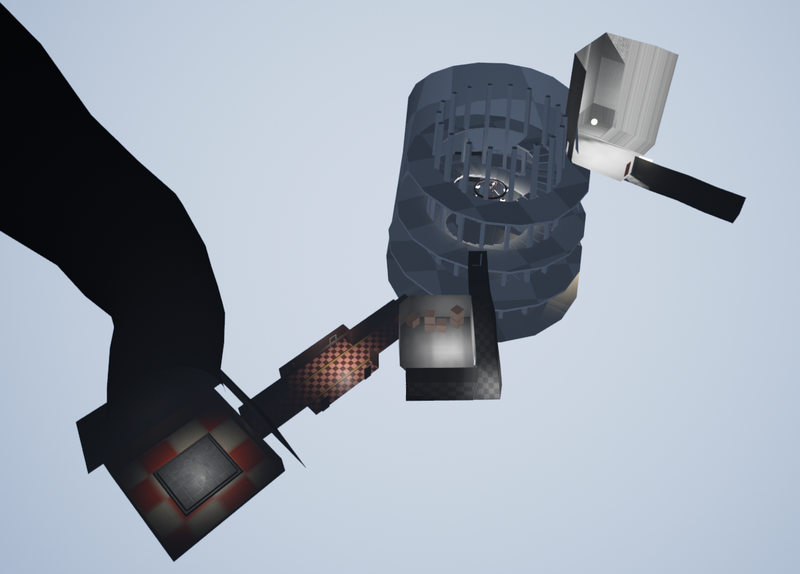 My workaround was to try and create straight sections of the outer lobby walls in order to counter the problem while the lobby gets smaller with each individual floor which still keeps the same forced perspective of the staircase. This also leads me to my next task, creating the spiral staircase. This is perhaps the most complex structural asset in the entire level as it relies on a few factors in order for it to look believable. Scale? - The size of the steps must be accurate as well as the bannister and the incline. The most daunting element is getting the entire staircase to fit between the floors as the whole lobby tapers in towards the ceiling, which makes using modular sections for the stairs impractical. The stairs must be at maximum three separate models (one for each floor) if we wanted to make sure the structure fits together properly. Ornaments? - One thing we decided very early is the use of wrought iron decor in our level, a victorian staple, creating this high detailed design in a curved formation around the stairs would prove difficult. This also applies to the bannister, which is the same issue of keeping the pieces modular. Connections to the floors? The staircases must attach seamlessly to each floor, this can by tailoring each staircase to fit plus use of modular trim assets to bridge any gaps in architecture (same process I'm using for other structural elements like the columns and arches.) Also the connection to the ground floor must be made according to the angle of the ground plane, which is off by 10 degrees, this calls for a start of the staircase to be angled correctly so it can be lined up. 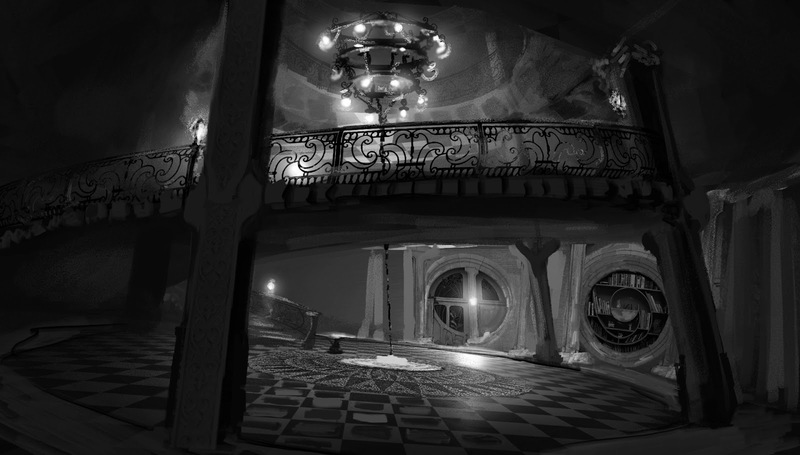 Also here's some paintovers of the level blockout just so we can make some quick decisions, the number of columns in the lobby and the look of the rabbit hole entrance hall were quite important areas to pin down as well as the library which needed some tweaking as the previous concept might have been too large to do. Alternate designs for the lobby, playing around with different amount of columns, flooring, some light arrangements and overgrowth. Off The Map VI: A sudden burst of colour!